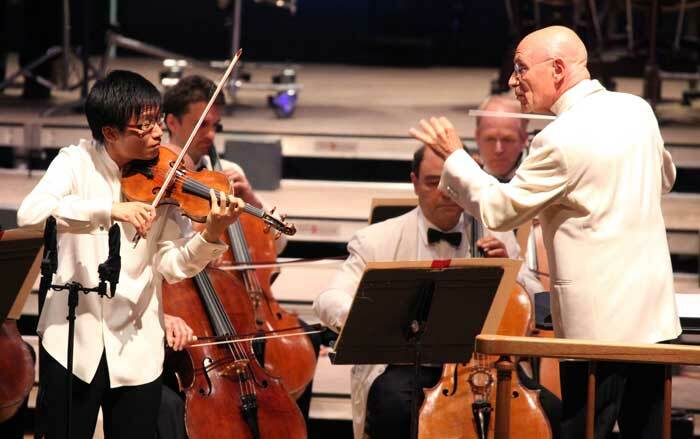 Tanglewood continued its season-long 75th anniversary fete last night with an unabashedly passionate concert featuring a program of Bernstein and Tchaikovsky conducted by the unabashedly passionate Christoph Eschenbach. A large audience augmented by 1,000 free ticket-holders on this annual “Berkshire Night” reveled in refreshingly cool conditions that included citronella-laced zephyrs playfully scampering through the Shed. Mother Nature’s air conditioning was particularly delectable after the hellacious week the Northeast had endured. Leonard Bernstein’s (1918-1990) Serenade, commissioned by the Koussevitzky Music Foundation in 1954, is, in the composer’s words, a “series of related statements in praise of love.” Utilizing Plato’s Symposium for its intellectual and structural underpinnings, this highly theatrical and pleasingly volatile work is a cerebro-emotional hybrid which explores the myriad facets of that most complex of human emotions. Each of its five movements is a musical representation of one of the speeches contained in Plato’s philosophical work. (Amusingly, the literal translation of the title Symposium is “drinking party;” sounds like something Lenny himself might have enjoyed!) Musically, this composition could just as accurately have been labeled a violin concerto. Dan Zhu, a Beijing-born New York resident, made for a compelling soloist, handling the numerous finger-twisting passages with unfailing adroitness and accuracy in this his BSO debut. His youthful vitality, precise bowing, wide-ranging expressivity, and athleticism were well suited to this work. The newly minted 30-year-old seemed completely immersed in the emotionally-charged score, as was Maestro Eschenbach, whose large, animated gestures and unusually engaged and precise left hand guided the BSO through a spirited performance. Actually, at times the conductor’s deft choreography and languid gestures took on the characteristics of some sort of new Olympic swimming stroke. Eschenbach and crew took concertgoers on a journey that ranged from sensual to lyrical to explosive to pacific to contemplative as Bernstein incorporated all manner of syncopation, jazz elements, and percussive accents and colors to translate Plato’s words into a thoroughly captivating musical score. The stage was aglow in a rich cobalt blue, a backdrop perhaps more appropriate for the Tchaikovsky that followed; for the Bernstein, crimson might have actually proved a more apt visual accompaniment. As with Leonard Bernstein’s musical creations, the works of Pyotr Ilyich Tchaikovsky (1840-1893) are supersaturated with emotion. His final composition, the Symphony No. 6 (“Pathétique”), premiering just nine days before the composer’s death, oozes passion from every lush musical pore. It should be noted that this piece’s extremely apropos sobriquet, coined by Pyotr’s brother Modeste and enthusiastically embraced by the composer, retains its original meaning of “passionate” or “emotional,” as opposed to the somewhat debased contemporary connotation. There is actually quite a bit of uncertainty as to the piece’s overarching meaning; though Tchaikovsky himself admitted that it did indeed have a theme, he was coy about shedding any light on just what that theme might have been. Some fragmentary notes, which may or may not in actuality refer to this particular composition, state that “the ultimate essence of the plan of the symphony is LIFE. … Finale DEATH — result of collapse.” Given its sweeping musical scope (with dynamic markings ranging down to pianissississississimo–pppppp! ), paroxysms of pathos, and subdued conclusion, this would certainly seem an appropriate interpretation. There’s also been rampant speculation as to whether this was Tchaikovsky’s deliberate “swan song,” given that his premature death has often been interpreted as a suicide. By all accounts, however, the composer was looking ahead to new endeavors, and apparently was in an uncharacteristically upbeat frame of mind. Regardless, this is music of a singularly gifted and tormented individual who wore his heart most prominently on his musical sleeve, à la Beethoven. This evening’s performance was awash in emotion and profundity, as Eschenbach crafted a sublimely beautiful and cohesive sound from the pulsating, finely tuned organism that is the Boston Symphony Orchestra. Particularly memorable moments included an ephemeral and otherworldly clarinet solo, a deep silence in the massive and nearly-filled Shed following the first movement, the novelty of a “limping waltz” (5/4) meter in the second movement, a brief burst of premature applause following the pyrotechnics of the penultimate movement (oops), the sharp glints reflecting from a highly polished tuba (ouch), a sprinkling of pellucid horn passages (aaah), and an achingly poignant and understated conclusion, another novel touch. Any performance that leaves you on your feet with tears in your eyes and a bittersweet smile on your face is one of rare power and depth. This was one of those performances.